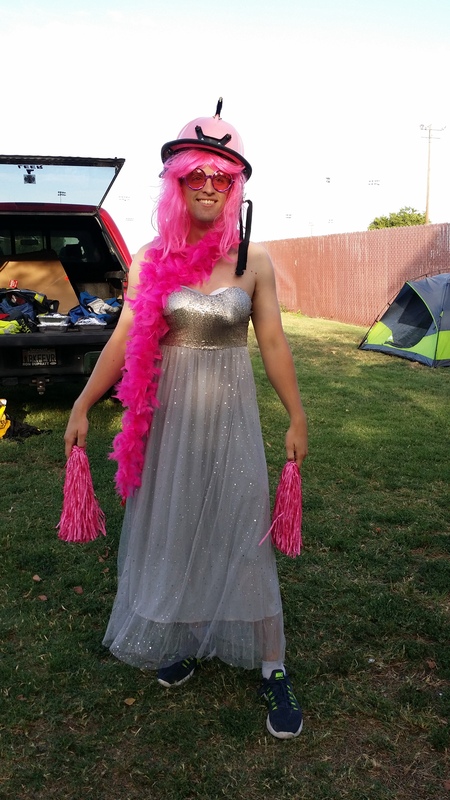 I completed my first 24-hour Relay for Life this past weekend (July 11-12). 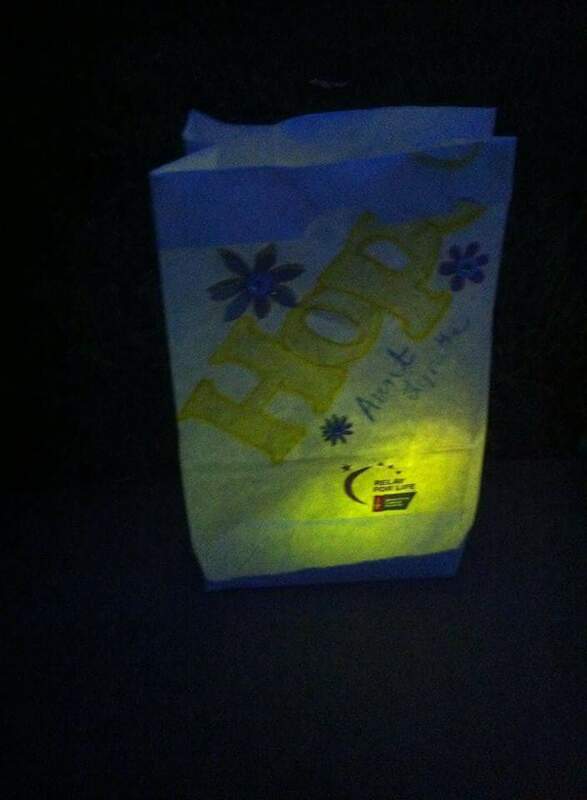 Next year, I hope to serve on the committee for the planning and running of the Relay. I was fortunate to have a great co-captain. Nicole and I kept each other motivated and we worked really well as a team. It was a good “get your feet wet” type of event. All in all, I walked a total of 17+ miles by the time we completed the final lap. My nine year old daughter stayed with me the for the entire event as well. She completed about 3 miles on her own. I’m very proud of her for sticking it out. She was enamored with sleeping outside in a tent for the first time. With each lap completed, you get the opportunity to pick up a bead to represent that lap. You choose the color(s) that work for you. 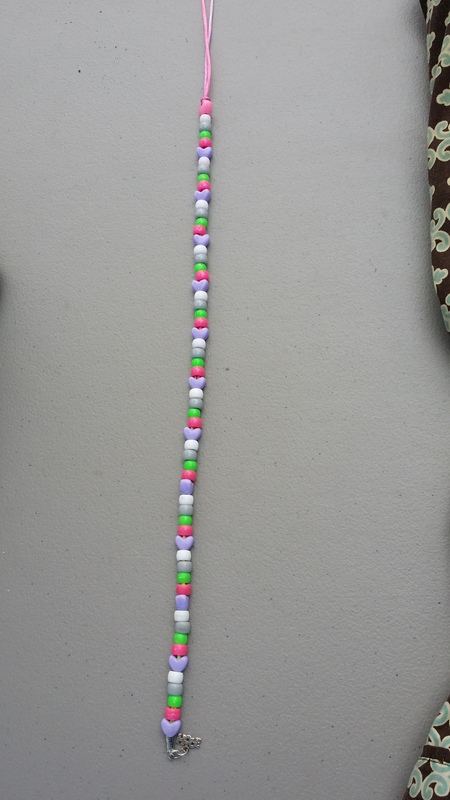 I chose beads to represent the cancers in my family: Stomach, Breast, Lymphoma, Brain and Lung. The wind was not our friend. It tried to take out booth and chuck it at the fire department across the track. Thankfully, our neighboring booth, had someone who staked it down for us. Next year, we will be prepared for the wind with weights and our our own stakes. I also learned, I am not meant to sleep on the ground. Since I don’t go camping much, I will invest in a good sleeping blanket and a cot to put that sleeping blanket on. Being as this was my first time captaining a team, I think we did rather well. One of the really fun parts of the Relay was the “Mr. Dixon” contest. Guys and boys dressed up as women, many donning pink, and walked around collecting money. The won who collected the most, was then named, “Mr. Dixon”. I couldn’t resist a photo and actually got a picture with him! 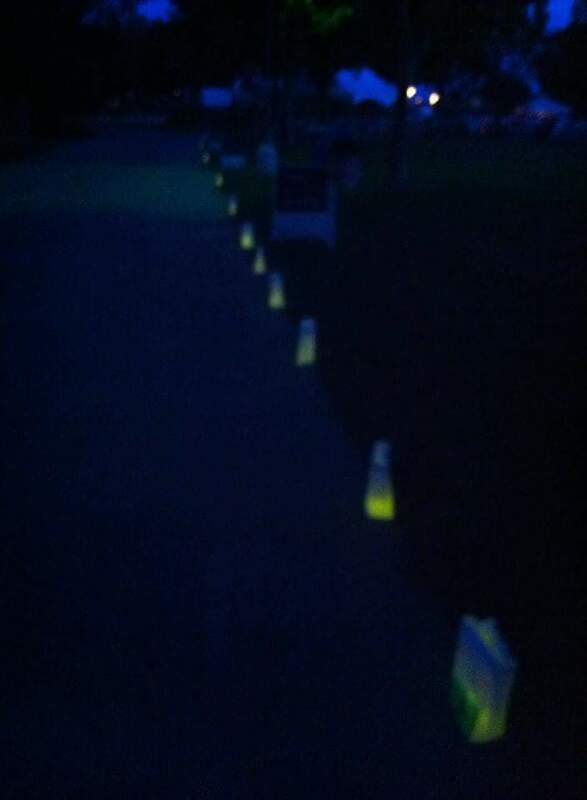 The luminaria ceremony was especially difficult for me. We heard two speakers; both survivors. The second speaker was 18 years old and a 12-year survivor. Her words were moving and powerful. 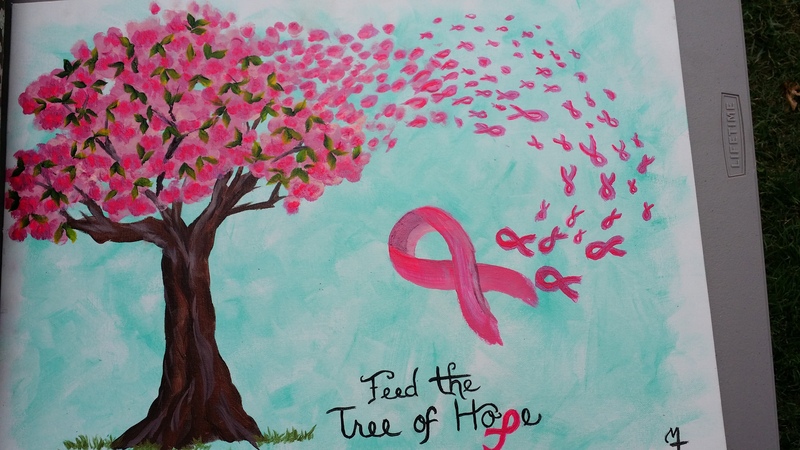 When she read the poem, “What Cancer Cannot Do”, the flood gates opened. I had read that as the closing of my sister’s eulogy. Then there was the slideshow. Seeing her on the screen sent me running for the bathroom. I was sick to my stomach because of all the emotion. I really am glad it was at night. There was no one to see my tears. We woke up around 3:00 a.m. and started our morning. 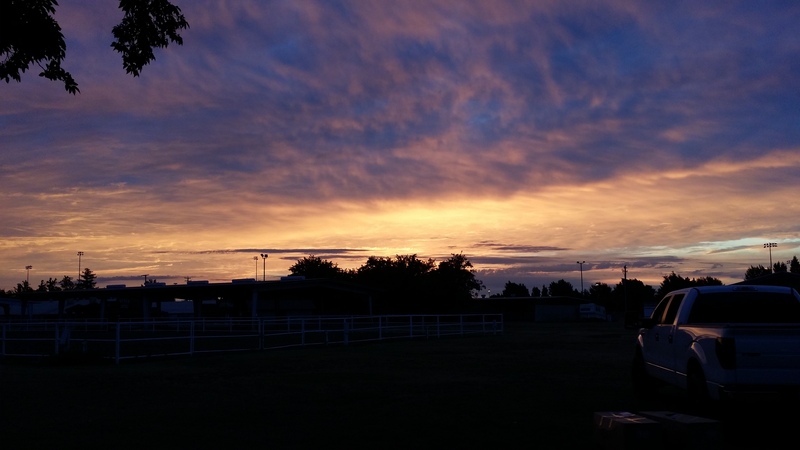 The nice part of waking so early is you get to see a beautiful sunrise. A reminder that it’s a new day with new opportunities. Another day to make a difference. I did enter a raffle for a painting that moved me as soon as I saw it. It’s an acrylic painting that was done by a local artist. I paid my $5.00 in raffle tickets and put them all in the painting raffle. After I woke up the next morning and resumed my laps around the track, the entire team stopped me. They remembered me and why I entered the raffle; told them about my sister. They were so pleased to inform me that I had won. I started crying again. The person I had spoken with about why I was drawn to it, actually cried when my name was pulled. She knew it would mean the world to me. I received several hugs from that team. 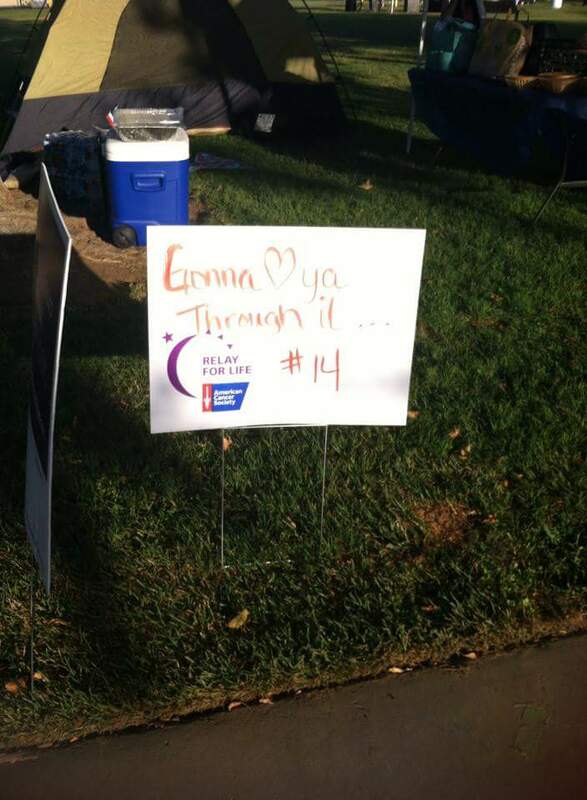 It’s amazing the love and support at flows freely at the Relay for Life. There is no judgement. We are all there for such a great cause. Whether you are there to help set up, work registration, are a survivor, a team captain, walking a few laps, making a donation or simply encouraging others, your dedication to the cause is valued. AWESOME – love the outfit! Great event and well done on doing it! Thanks! Next year’s goal is 18 miles…at least one more mile than I did this year. My co-captain completed 24 miles. I had my 9-yr old with me, so she got some “mommy time” instead of me walking.